Those dropped fruits are one reason that these vines — Actinidia kolomikta — are not as popular for fruit as another species, Actinidia arguta. Ripening, and dropping, is fast in the heat of July. Arguta kiwis ripen in late summer and early fall, and possibly cling to the vines more reliably then because cooler weather slows ripening. Not that either of the fruits are well known. Both are cousins to the fuzzy kiwis (A. deliciosa), ubiquitous in supermarkets. Both hardy kiwis differ from the fuzzies in being cold-hardy (only to 0°F for the fuzzy as compared to minus 30°F for A. arguta and to minus 40°F for A. kolomikta), grape-sized, with smooth, edible skins, and better flavor than the fuzzies. 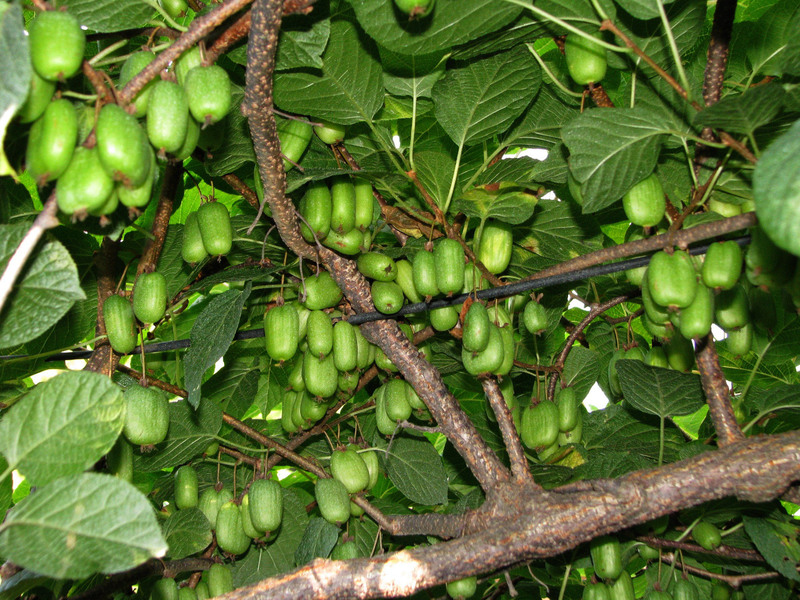 In addition to ripening earlier and dropping more readily, kolomikta kiwis differ from arguta kiwis in coming into bearing much sooner, often in their second year, and growing much less rampantly. Argutas are hard vines to tame. Ornamental vines of both species gracing historic gardens for decades before their fruits were noticed and appreciated is testimonial to their beauty. Kolomikta’s leaves are brushed silvery white with random pink blushes. Back to harvest. Harvest from the ground is unfeasible because the green fruits are too hard to find among the blades of green grass. And unhealthy because of all the processed kiwifruits — poop — the ducks eject at their far end as they gobble up the berries. A ground cloth to catch the berries would become similarly soiled unless I went to the trouble of spreading it, shaking the vines, then gathering up the cloth after gathering up the fruits. Instead, I’ve taken to walking beneath the vines with a large umbrella, upturned, and shaking portions of the vines right above the umbrella. Ripe fruit drop into the waiting “funnel.” Sure, many fruits are lost, but the vine bears more than enough to share with the ducks, who can enjoy the missed fruits. Like apples, bananas, and avocados, kiwifruits of all stripes are climacteric fruits. Instead of steady ripening, climacteric fruits, just before they are ready to eat, go through a burst of ripening with sugar levels and carbon dioxide production all of a sudden rapidly increasing. Fruit quality begins to decline right after this burst. If picked when sufficiently mature, but not dead ripe, kiwifruits store well for a few weeks. They’ll ripen during storage, slower under refrigeration, faster at room temperature. From experience, I know that “sufficiently mature” for kiwis is when the first fruits start ripening. So, in addition to my umbrella harvesting, I’m harvesting a bunch of the unripe fruits and refrigerating them to extend their season. Don’t worry; there’ll still be plenty for the ducks. Every time I walk back to the kiwi vines, I pass a perennial flower bed. Or, at least, what was supposed to be a flower bed and now is bordering on half flowers and half weeds. The major two weeds, I admit, are my own doing. The first of these weeds is dayflower, which arrived here with some bee balm plants from a friend. It’s actually a pretty plant with small, blue flowers, and it’s easy and satisfying to pull out. To a point. The other weed, groundnut, was a deliberate planting, by me, about 20 years ago. 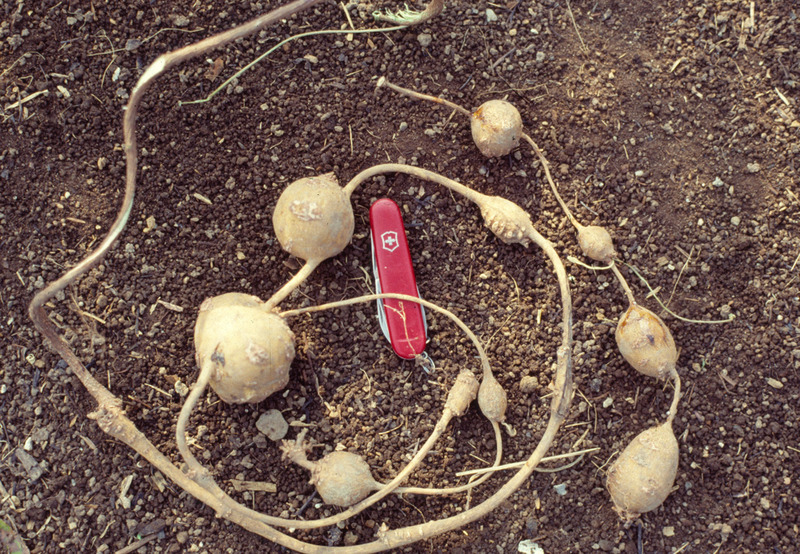 It seemed interesting, bearing edible, golf-ball-sized tubers that string along underground like beads. Groundnut reputedly is the food that got the pilgrim’s through their first winter. 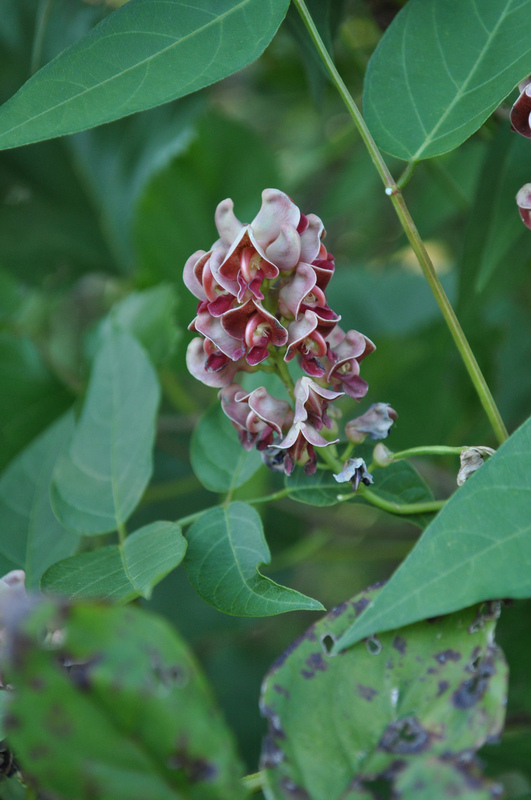 Occasionally the plant, a vine, flowers, bearing chains of pale chocolate-colored blossoms. Do I remember them smelling like chocolate also? Perhaps. With all the other vegetation in the bed, the plants haven’t flowered in a long time. The problem is that those chains of tubers spread to make more chains of tubers which, in turn, do likewise, ad infinitum. The vines now creep over almost every plant in that bed but rarely get enough space to themselves to make tubers anymore. No matter. They didn’t taste that good anyway. I wasn’t as foolish as might seem planting groundnut in that flower bed. Twenty years ago that flower bed wasn’t a flower bed, but just a place for interesting plants in my then small garden. This entry was posted in Fruit, Gardening, Pests, Vegetables and tagged Actinidia, Apios americana, arguta, ducks, groundnut, kiwifruit, kolomikta. Bookmark the permalink. Trackbacks are closed, but you can post a comment. « SO MANY FRUITS, SO LITTLE . . . ? I just love symbiotic relationships. I planted both a kiwi and ground nut. The kiwi is taking off this year – not sure of the variety at this point, but the leaves are all green. Not sure if my ground nut came back as it is in a “wild” area that I can’t really get to in August to check. I see vines but they are the devil bindweed. Ground nut would be more welcome than bindweed. I hope to be shaking down some kiwis one day, although I do not have ducks but there are plenty just down the block in French Creek – maybe if I put up some sort of sign? Free kiwis, ducks welcome. A great idea with the umbrella! Once I shook a few down, I actually harvested all the rest for ripening off the vine. 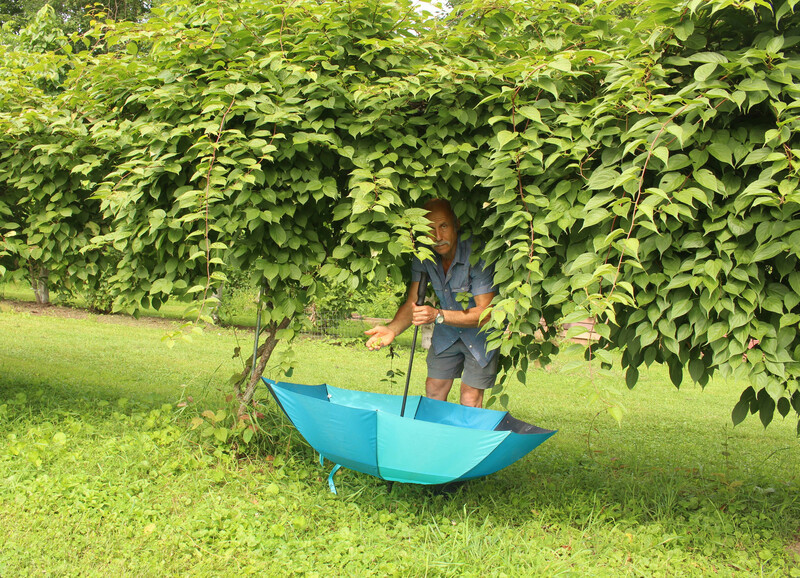 The umbrella was very handy again, this time as a large, soft landing area in which to throw harvested fruits. Once harvested, it was easy to scoop them out of the umbrella into storage containers. I read every post but often forget to leave a comment. Finding your entries really enjoyable to read and the info is so useful to me as I grow my little home orchard. I have an Actinidi arguta pair but am twiddling my thumbs waiting for a bit of fruit. Will look at the kolomikta! I have Frangula caroliniana growing wild here in NH. Tons of ripening fruits, but I can’t find conclusively if they’re safe to eat. Are they? Thanks. Quoting from a web site: “Songbirds and other wildlife consume the berries, which apparently have medicinal properties but can be toxic.” I wouldn’t eat them. 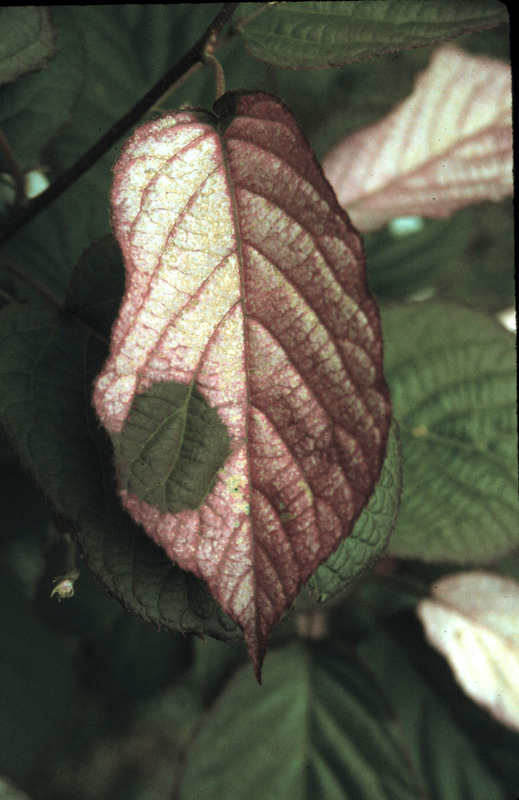 What varieties of Actinidia kolomikta are you growing? I have enjoyed Red Beauty’s fruits for a couple years,and so I sought out cultivars selected for fruit this past year, re-branded ones from OGW, and Kroplodanaya from Trippel Brook. I’m growing the varieties September Sun, Aromatanya, and Krupnopladnaya.